Trade show update, the “Reverse RDP Attack,” and current IOT trends are featured in this week’s rundown. 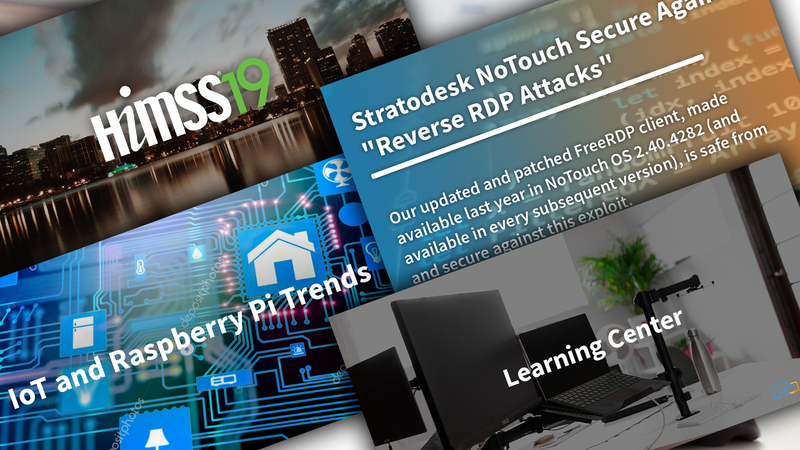 Read below for some of Stratodesk’s biggest highlights and relevant industry trends that matter to you. This week Stratodesk was at HIMSS 2019 showing how our software secures endpoints and increases accessibility to apps and data in a healthcare setting. We’d like to thank everyone who visited our booth at HIMSS19! We enjoyed meeting you! And we couldn’t be more proud of how we partner with Imprivata and Citrix to deliver exceptional patient care! See you next year! The show kicked off with a super hero themed reception. The super hero theme is meant to tie in with the larger conference theme that is “Champions of Health Unite.” You can read more about the theme and the reception by clicking the link below. Check Point Research announced that they have discovered significant vulnerabilities in the Remote Desktop Protocol (RDP). Labeled “Reverse RDP Attacks,” these vulnerabilities make it possible for hackers to reverse the usual communication direction and infect the targeted device. Stratodesk NoTouch OS, however, is immune to these vulnerabilities. Read the full statement on our blog post below. New to the world of Thin Client technology? There’s a lot to learn. To help you out, we’ve compiled a list of very frequently asked questions about the end user computing space. On our learning center page you can learn the basics behind Thin Clients, Raspberry Pi Thin Clients, Thin Client Management software, and more! What Do We know About the Raspberry Pi 4? The Citrix Ready workspace hub is built on the Raspberry Pi 3, and Stratodesk software powers that device. But will there be a new Raspberry Pi available anytime soon? The Raspberry Pi 4 may not be on the market any time in the near future, but when it does appear, it may include some significant enhancements. There are three steps you will need to follow in order to ensure IoT security. These are incorporate infrastructure security, strengthen the authentication procedure, and lastly, set strong passwords. Dive deeper into these steps and learn more in the blog post below. The Internet of Things can help wine growers and wine makers control environmental variables and gain more insight into the wine production process. That’s it for this week’s news update. For more stories like these, follow us on Twitter, and stay current with our blog for the latest news from Stratodesk and the worlds of Healthcare IT, VDI, IoT, the Cloud, and EUC.